Two suspected traffic robbers, identified as Oyakhilome Okonkwo,22 and Oche Joseph, 25who allegedly stole N23,500 from a passenger in the Agbado area. 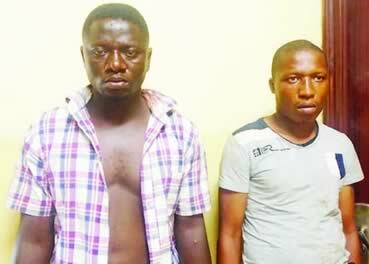 The suspects that were nabbed by the RRS men at the U-Turn area on Tuesday after they had allegedly disguised as bus passengers and stolen N23,500 from a passenger. It was learnt that when the yet-to-be-identified passenger alighted at the U-Turn junction, he observed that his money was missing and alerted the police on patrol. The passengers in the bus were said to have been searched during which the duo were found with the money. Joseph, who confessed to the crime, said he had done several vocations, but none had fetched him money like stealing. Joseph, a resident of Mosalasi Street in the Ojo area, added that he had worked with Joseph for three months. He said, “The Agbado area is the most lucrative route for this business. There are too many pickpockets on the Oshodi-Mile 2 route. I decided to choose Agbado because pickpockets are not many there. “We usually monitored our victims coming out of banks and we would follow them into buses. Today, we were at the bus stop where the victim was, but we could not remove the money at the bus stop. “So, Oche (Joseph) and I followed him into a bus and we began to pick the money from his pocket. The money was in N500 denomination, so it was difficult to remove the entire money at once. I started removing the money in tranches, but unfortunately for us, the passenger alighted not far from the bank.